I am feeling very blue today. As I took my children into school this morning I heard one of the other mums say to someone 'the post office in the village has been burned to the ground'. I use this post office every day (sometimes twice a day) to post my smaller parcels and the staff there are just so lovely. I am sad because this was owned by a husband and wife. Their business destroyed. They have been fortunate to have so far avoided closure (unlike so many other PO's), largely because of their determination. Another sadness is for one of the staff members. She had been collecting sponsors for months now because in October, she is going to ride The Wall Of Death (sitting on the handlebars of the motorbike) for the charity Wishes For Kids. She was aiming for a target of raising £2,000. Only last week I asked how it was going and she said she would excede the target. How wonderful! She was getting rather nervous about it. The sponsors were on a clipboard in the post office and (since I doubt she would have taken it home of an evening) was probably destroyed. How very sad. Apparently, burglars broke in and I think the fire was a result of their efforts to break the safe. It took 40 firefighters to bring it under control but now, it's all gone. What will the pensioners do? Will it be rebuilt (or will it be a perfect opportunity to close yet another)? What about the owner's business? What about those who worked there? 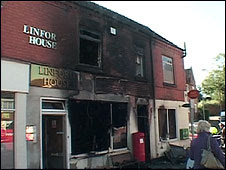 It was at the heart of the village and part of the community for many, many years. I really feel a great sense of deep loss. I am perplexed that another human being could create such destruction to not only someone elses property but also something so central to whole community. Yes, H is really feeling sad today. I hope and pray with all my heart that it can be rebuilt and restored once more. That is a great shame H! I hope that the PO gets reinstated and that the powers that be don't delay and delay until it's too late.